Are you on the compact chainrings already so that you can't go smaller in the front? @tommasini Where did you see that mention (of Recon cassettes)? I checked their website and found nothing. Hope you're right and they're coming, especially in Ti. Last edited by mag on Thu Nov 08, 2018 11:30 am, edited 1 time in total. I went to the Recon 2018 catalog page 3. 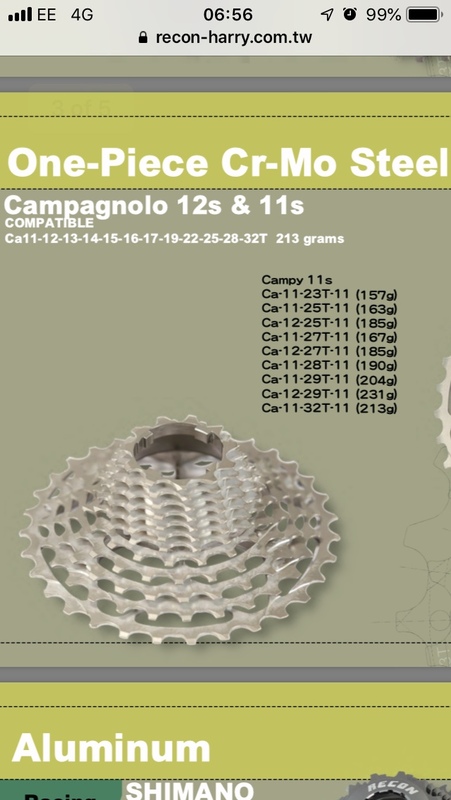 There they list a steel 12 speed 11-32 cassette amongst some steel 11 speed offerings. Seeing how they offered a number of Ti casettes in 11 speed Campy I'm hoping they get around to offering more 12 speed light options in the future. I wrote them to learn more earlier this week - no reply yet. Think you might want to look again. No mention of an actual 12 speed cassette. Yes it must be that. A little strange and confusing that it has exactly the same declared weight as 11 speed 11-32, but 12 sprockets there are. Two thoughts on the Recon listed weight - one is that with a 2018 date on their website literature (Campy had only just announced 12 speed a few months ago), that perhaps they don't really know the final weight yet - that its only in the development pipeline so they used the same weight as 11 speed just because they don't know....but do notice that the left hand picture of a cogset DOES show 12 cogs. Second thought is the slight thinning of spocket material (11 speed is 1.6mm) x 11 sprockets might just about yield you a 12th cog for the weight of 11.......for instance Recon aluminun 10 vs 11 speed cassettes (same cog range) the 11 speed is only 5 grams more. For Titanium Recon the 11 speed is only 4 grams more than same cog range of Ti 10 speed. All this brought me back to remembering this from Bike Rumor: "Lighter versions possibly with ti cogs are in development. So far Campy hasn’t seen performance improvements over these steel clusters, but will continue to work on lighter options". Gosh I do hope they find a lighter way to go AND adopt a 12-27. Just watched a YouTube video by Cycling Weekly on Valverde's 2018 World Champion bike. Or at least the bike he is riding after winning. He is using an 11 speed Campagnolo cassette. Why "wasn't" and why "isn't" Valverde, the current World Champion on 12 speed Campagnolo? Bike has 53-39 rings and 11-27 eleven speed cassette. The cassette is 11-12-13-14-15-17-19-21-23-25-27. The twelve speed 11-29 cassette is 11-12-13-14-15-16-17-19-21-23-26-29. Close enough to matching. I cannot understand why the current World Champion is not using Campagnolo's latest and greates bestest groupset. Why is the current World Champion on a now ten year old, discounted, marked down, clearance table groupset? Does anyone at Campagnolo have their SH-T together? Apparently not. Maybe because 12 speed eps is still in the final stages of production and hasn't officially been released or any official pictures shown to the public yet. So why would they show this on his bike now? Plus the current 11 speed is from 2015. Also, 12 speed came out late this year and Movistar probably wouldn't want to do a mid-year change on every bike and wheelset? Plus, they'd have to switch back to mechanical 12 speed or ride EPS prototypes. One thing that is for certain is that Campagnolo never seems to be in a hurry. Campy likes to keep the wraps on stuff too.. the 12 Mech was a total sneak attack... Im sure EPS 12 will be the same. There are probably a few more protos out there as well that are well hidden that we know nothing about..
As for the wheelsets, theres nothing to do, undo an 11 spd lockring, slide on a 12 spd block, lock down 12 spd lockring... wheel requirements complete... thats what awesome with Campy the freehub body hasnt changed in what 15+ years now?!? They have 25 guys on the mens team and 10 on the womens team. They have multiple bikes per rider, spare bikes, TT bikes, etc. It would be a bike mid-year change for a team. These guys are pro mechanics and there's more than one.. one guy could probably strip and rebuild a bike in a few hours.. Remember when Fortuneo decided to do a full change 2 weeks before the tour? I never said it couldn't be done. You said it was "a few bikes". It's a lot more than a few bikes. And they are going to switch from EPS to mechanical and then back to EPS when EPS 12 speed is available?